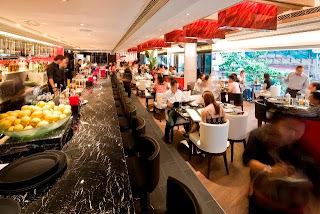 Now back to Gastronommy's Hong Kong Noms Series! As a reminder, the Hong Kong Noms Series focuses on specific Gastronommy favorite dishes rather than the entire menu at particular restaurants. My preference for a specific dish may not reflect my impression of the rest of the menu. Also, my chosen numerical order of listing is not based on any ranking. It just helps me keep track! I know I'm not the first in wondering how an established gym chain can also run a decent restaurant. I assumed the dishes would be purely health based instead of taste based... not something I'm wild about. So, I've always been a skeptic of PURE Group's restaurant, RED until I finally gave it a shot this past year. Geoff, the Marketing Manager for PURE Dining, graciously hosted one of our friendly meet-ups at RED for fellow foodies around town (including foodies from HKFashionGeek, Geoffstwitchen, WOM Guide, and others). The menu was surprisingly not as healthy and green as I had expected! Buttermilk fried chicken, steaks, creamy soups, giant burgers, cobb salad... Geoff later explains PURE believes in a balanced lifestyle: work hard, eat hearty. At some point during our Twitter-Foodie meetup, two young women kept gushing on and on about the mac & cheese. Now, I've had my fair share of mac & cheese experiences in New York. There are establishments in Manhattan that serve nothing but all sorts of mac & cheese (more on that on a future NYC Eats entry). How good could this mac & cheese at some Hong Kong gym-related establishment be? It really was that good. 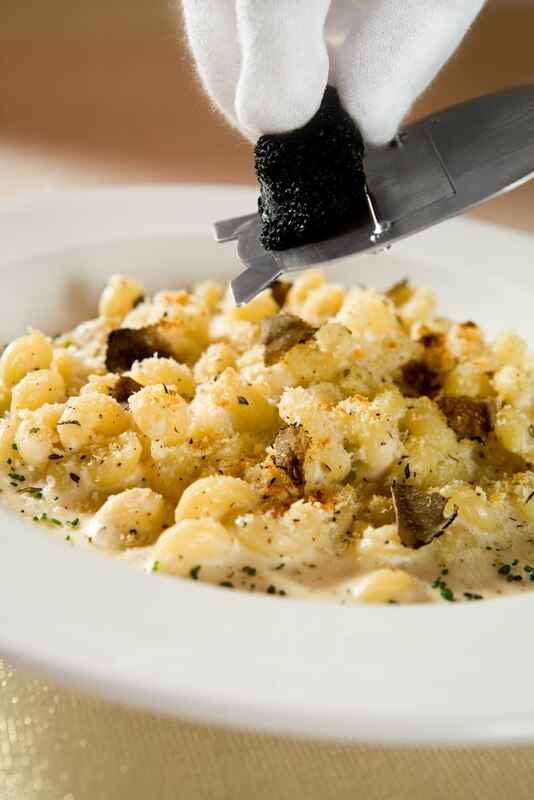 It seems RED's Chef Mody Lee and Chef Pong's mac & cheese research in NYC has paid off! The only downside was that I had to share the dish between four of us who were initially only curious about the dish. The truffles themselves have nothing to toot about, but the overall dish hits a delicious level of heartiness that leaves you licking the bottom of the plate for more (the two pretty slim girls who originally recommended this dish to all of us were wiping the bottom of their giant plates clean). 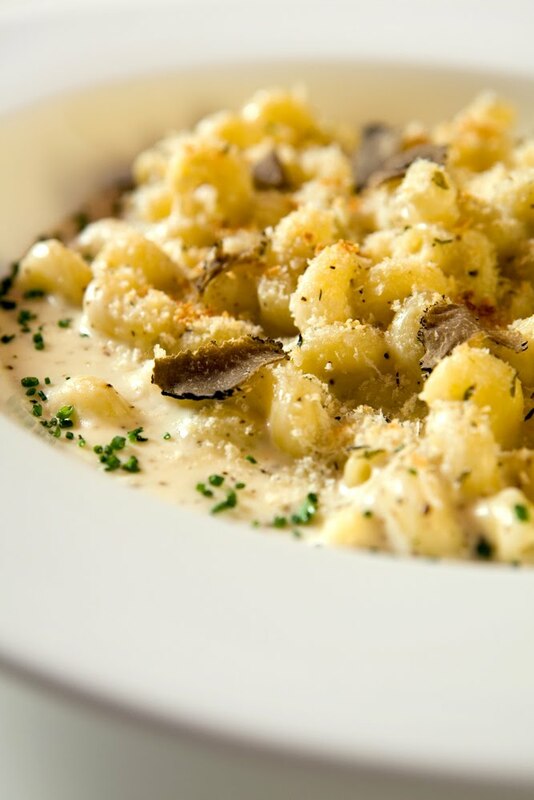 The dish includes a delectable combination of cheddar, swiss, gruyere and parmesan cheese. I've been back to RED several times since in the past few months, simply for the Truffle Mac & Cheese. Oh, and their bread basket is ridiculously addictive. All photos in this entry were provided by RED Soho, since my camera couldn't take decent photos in the dark :( For the concerned: This is NOT a sponsored entry by PURE or a favor for their Marketing Manager. Umm... why is your HK Noms series all western food? Like, not even fusion. Truffled mac n cheese, potatoes and chorizo? Do I need to go to HK and show you real old-school HK food?